Railway Athletic (blue) v Ruskington Rovers (red). Tom Ruck (blue), Ryan Norris and Matt Leonard (red). Workforce Unlimited Premier Division (KO 2pm): Fulbeck United v Wyberton Reserves (M. Thomson), Ruskington Rovers v Benington (J. Banasik). Workforce Unlimited Division One: Freiston v Woodhall Spa United (R. Crozier), Horncastle Town Reserves v Swineshead Reserves (M. Redgrift), JFC Seniors v Pointon Reserves (T. Lefler), Skegness United v Boston College (D. Davies). 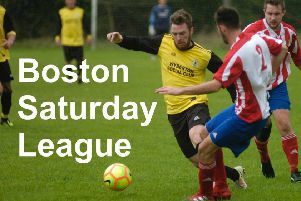 Workforce Unlimited Division Two: Boston Athletic v Boston International FC (R. Shortland), Caythorpe vFC Wrangle (R. Dungworth), Coningsby Reserves v Colsterworth SSC (P. Keeble), FC Hammers v Railway Reserves (S. Gillespie), Wyberton A v Holbeach Bank (M. Winwright). Workforce Unlimited Division Three: Benington Reserves v Skegness Town A (M. Bruntlett), College Reserves v Eagle United (J. Ulyatt), Fosdyke Reserves v Woodhall Reserves (T. Page), Leverton Reserves v Digby (L. Crawford), Northgate Olympic v Old Doningtonians Reserves (S. Marriott), Swineshead A v Spalding Harriers (R. Larcombe). BB Insure Willoughby Cup, round one (KO 1.30pm): Friskney v Sibsey (P. Hindle), Old Leake v Fosdyke (P. Revell). BB Insure Willoughby Cup, round two (KO 1.30pm): Kirton Town v Park United (J. Harmer), Mareham United v Railway Athletic (S. Beaumont),Old Doningtonians v Coningsby (K. Swinbourne), Pointon v Swineshead Instituite (C. Armond), Skegness Town Reserves v Leverton SFC (C. Varty), Spilsby Town v Billinghay Athletic (R. King).